Weather: Upper 60s to start. Low 80s to end. Sunny. Tailwinds for the most of the day. Very squirrelly winds on the climb to Teton Pass. This tour continues to break with the norms. 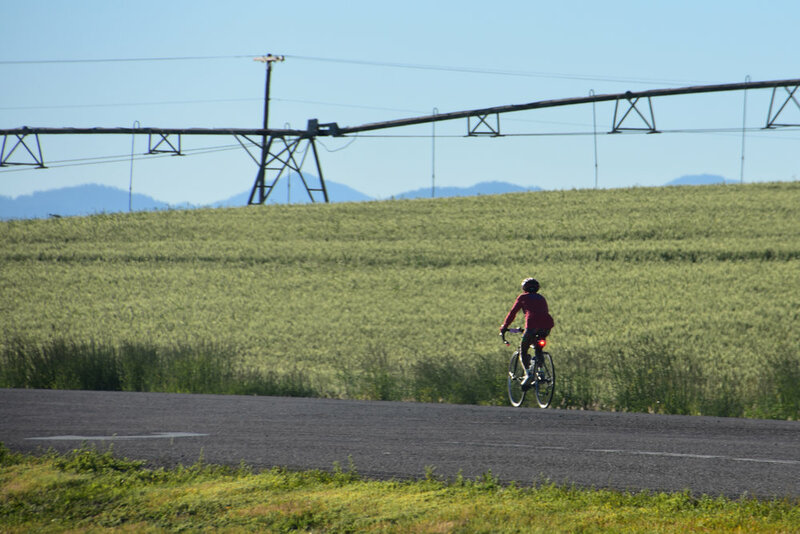 Today’s route in renowned for headwinds on the way out of Idaho Falls. Karen warned the riders that this is usually the case. But for this group? Nope. They had more tailwinds that stuck with us all the way into Victor. 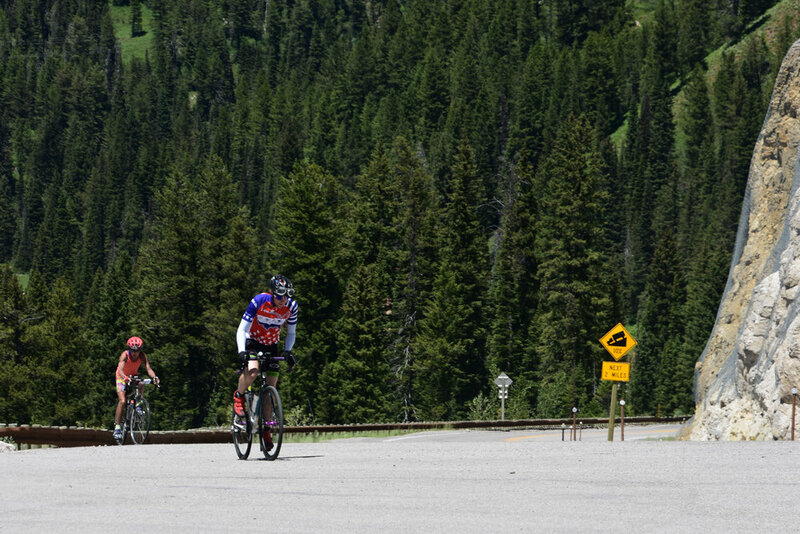 There they changed on the climb to the summit of Teton Pass. More on that topic a little later in this post. 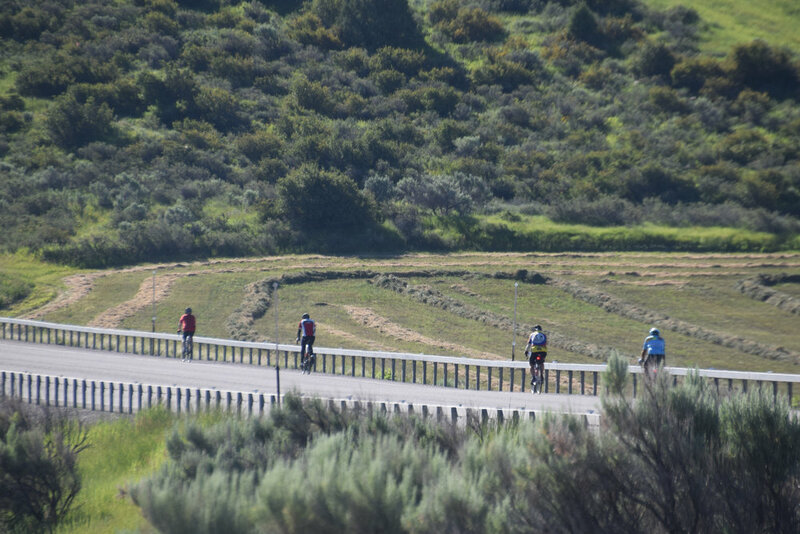 Our first SAG stop was at a rest area that overlooked the Snake River. Hills, water, sunshine – stunning. We climbed a bit and then descended quickly to ride along the Snake River. Stunning! It’s repetitive but accurate. A left turn onto Rte 31 brought us to the first big climb of the day – Pine Creek Summit @ 6764’. I would describe this as a relatively gradual 14-mile climb – mostly 4-6 percent except for the last mile or so when it bumps right up to 8. And then there was the descent into Victor. Non-technical. Good roads. FAST! Victor provided a brief pause to refuel before the signature climb of the tour. Teton Pass @ 8431’. It starts off innocently enough out of Victor. At 1-2 percent, it’s almost as if you’re not climbing except that your head is wondering why your legs aren’t making you move a little faster. 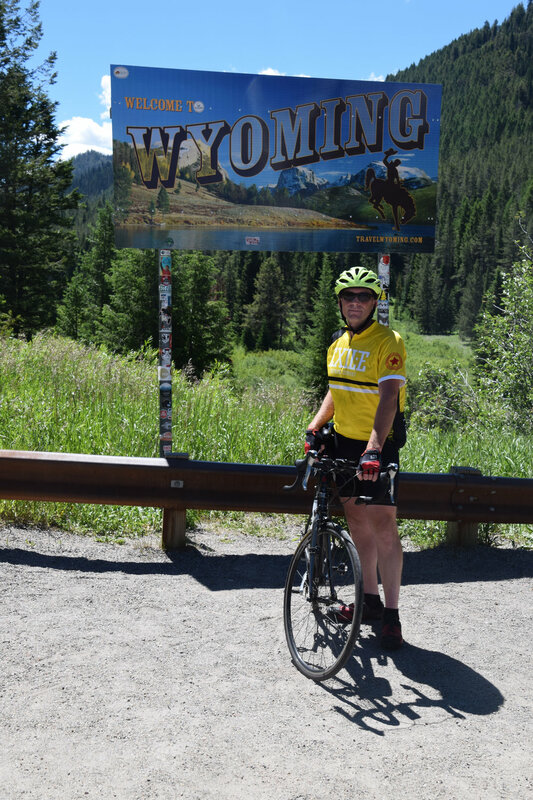 The Wyoming state line (our second state line of the tour), complete with a big sign and many pictures, marks the start of the “real” climb just over 5 miles outside of Victor. The next 6.6 miles definitely challenged the riders. The grade gradually increased each mile with the last two miles topping out with an average of just over 10 percent. That is not insignificant especially when you add the swirling winds that occasionally slapped the riders right in the face. It was one tough climb today. Then there was the descent into Wilson. It is a technical and steep descent that we discussed at length at last night’s route rap. It is not a descent for the riders to try push the envelope in terms of speed or their comfort. We even recommended that they take a couple of breaks on the way down to enjoy the scenery behind them and to give their hands, that have been working the brakes, a rest. All riders listened and heeded the advice. All riders made it in to Jackson safely. All staff members broke into a happy dance in celebration. For now, the riders are under strict orders to hydrate, refuel, and rest. They will need all three for tomorrow we climb again.